Making communication easier, faster and more enjoyable is an ongoing process. With the release of WebApp 3.0 earlier this year we’ve made some massive improvements to the overall look and feel of WebApp. We are getting closer to the release of WebApp 3.1.0 and are ready to make a release candidate available, the last step towards a final! 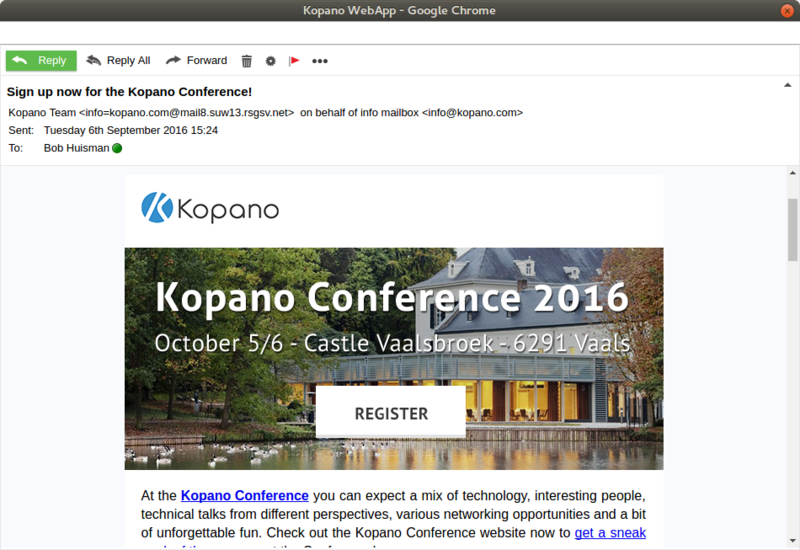 WebApp now offers the possibility to read and compose email messages in a separate window. This makes it even easier to work with multiple displays, view other content when composing or do a side-by-side comparison of multiple messages. Click on the ‚pop-out‘ icon to use this feature on a single email, or alternatively set the default behavior in your personal settings! 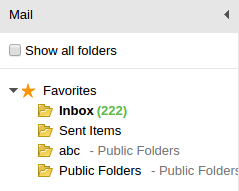 Many people use multiple folders in their mailboxes, or work with shared mailboxes or public folders. In many cases some of these folders are used more often than others. WebApp 3.1 will have a ‚favorite folders‘ feature to make life easier: you can set any folder (your own, or shared) as a favorite folder. This will cause it to always appear at the top of your folder list (in the separate favorites section). A lot of new features have been introduced in the past months, and we’ll continue to do so in the months to come. To make sure all of these features are accessible when you need them we have introduced a new button in the preview and editing views. And we’ve called it the ‚more‘-button. This button is a dropdown list of less-often used functions that can come in handy when working, such as ‚edit as new‘ (which has been enabled for all subfolders now). Kopano WebApp 3.1.0 RC 1 and newer will be compatible with ZCP 7.2.5 and newer. What will happen from the technical side is that WebApp will accept php-mapi 7.2.5 and newer. This means you can start using the newest Kopano features even if you have not been able to migrate your ZCP installation to Kopano Core yet! Thanks to our Hungarian partner Serverside for providing Hungarian translations for WebApp! Hungarian can now be selected by default. You can now also enable a Polish spellchecker in the HTML editor by installing the new spellchecker pack. Some of the code modifications in WebApp change the way plugins are handled. This means that most of the plugins will need to be updated to the latest version in order to continue to work with this new WebApp version. This affects Files (and any backends you have installed), S/MIME, MDM. Compatible versions of these plugins have been released together with the last beta. Newer versions of plugins are still compatible with older versions of WebApp, not the other way around. You will need to restart your webserver after installing these updates. DeskApp will also require an update to support the pop-out window for email feature that can be found in WebApp 3.1. If DeskApp is not updated, opening email in a new browser window will result in the message being opened in your default browser instead of a DeskApp window. Where do I get the packages? The packages can be found in the repositories, the portal and the download server (all require login). The changelog is available here. You can find the latest development version of WebApp (and the plugins) on the community download site. If you have any feedback (which is very welcome!) 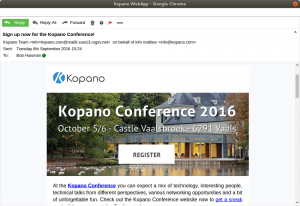 on this RC release please use the regular support channels or send an email to feedback@kopano.com.